Prelude :In the “Geography of History” series we have learned the evolution of mankind from hunting gathering societies to agricultural societies.The invention of agriculture led to far-reaching changes in human societies. One important result was the emergence of cities and civilizations. This series covers one of the most important civilization – Harappan Civilization – be it in prelims or GS mains or History optional . There are certain themes that UPSC has been asking for many years and will keep on asking years to come.Few of such themes are – Buddhism, Harappan civilization, Gupta age , Akbar’s policy etc.Hence from exam point of view this series is quite important. In 1826 an English man Charles Masson visited a village named Harappa in Western Punjab (now in Pakistan). He noted the remarkably high walls, and towers of a very old settlement. He believed that this city belonged to the times of Alexander the Great. In 1872, a famous archaeologist Sir Alexander Cunningham came to this place.The people of the surrounding areas told him that the high mounds of Harappa were parts of a thousand-year old city.His views concurred with the local folk tale and believed that the city was 1000 yrs old. The finds from Harappa had similarity with finds of another place known as – Mohenjo-Daro in Sind. In Mohenjo-Daro the settlement lay underneath a Buddhist monastery belonging to the Kushan period. It has been found that in ancient times if a house was destroyed for some reason people would generally use the brick or mud of the house to prepare a plinth and make another house on top of it. The cities were part of an age when iron was unknown. When Marshall published his discoveries some other writers found objects similar to those of Harappa and Mohenjo-Daro in Mesopotamia. 5500-3500 BC – Neolithic – In Baluchistan and the Indus plains settlements like Mehrgarh and Kili Ghul Muhammad came up. Beginning with 3500 B.C. pastoralism with limited cultivation and seasonal occupation of the villages, permanent villages emerged. Knowledge of wheat, barley, dates, cotton and sheep, goat and cattle. Evidences of mud houses , pottery, craft-production found. Many more settlements established in the hills and the plains. Harappan Largest numbers of villages occur in this period. Use of copper, wheel and plough. Emergence of uniformity in the pottery tradition throughout the Indus Valley. Also, the origins of such motifs as Pipal, humped bulls, Cobras, horned deity etc . Evidence of granary, defensive walls, and long distance trade. Emergence of large cities, uniform types of bricks, weights,Harappan seals, beads and pottery. Planned township and long distance trade. Interregional exchange Harappan declines. Writing and city life abandoned. Continuation of Harappan Crafts and pottery tradition. The village cultures of Punjab, Sutlej-Jamuna divide and Gujarat imbibe the Harappan crafts and pottery traditions. Beginning with the discovery of Harappa, nearly thousand settlements having similar traits, have been discovered. Archaeologists prefer,to call it the ‘Harappan Civilization‘. This is because in archaeology there is a convention that when an ancient culture is described, it is named after the modem name of the site which first revealed the existence of this culture. This geographical space would roughly cover the areas of modern-day Rajasthan, Punjab, Gujarat, Pakistan and some of the surrounding areas. The Harappan civilization represents the culmination of a long period of evolution of agricultural and semi-nomadic communities. Baluchistan are characterized by steep craggy hills , inhabited by Pastoral Nomads.These pastoral nomads with their herds of sheep, goat and cattle kept shifting from uplands to low lands in search of pastures for their herd. These hilly regions are fractured by many passes, like those of Khyber, Gomal and Bolan.These have acted as highways of traffic for nomads,merchants, warriors and various groups of people. the communities of Iran on the other seems to be related to this geographical feature. Beginning as a seasonal camp the place turned into a settled village in the 5th millennium B.C. Mehrgarh is located at the place where the alluvial plains of the Indus join the uneven hilly plateau , of the Indo-lranian border-land. People of Mehrgarh lived in mud houses which could sometimes have five to six rooms. 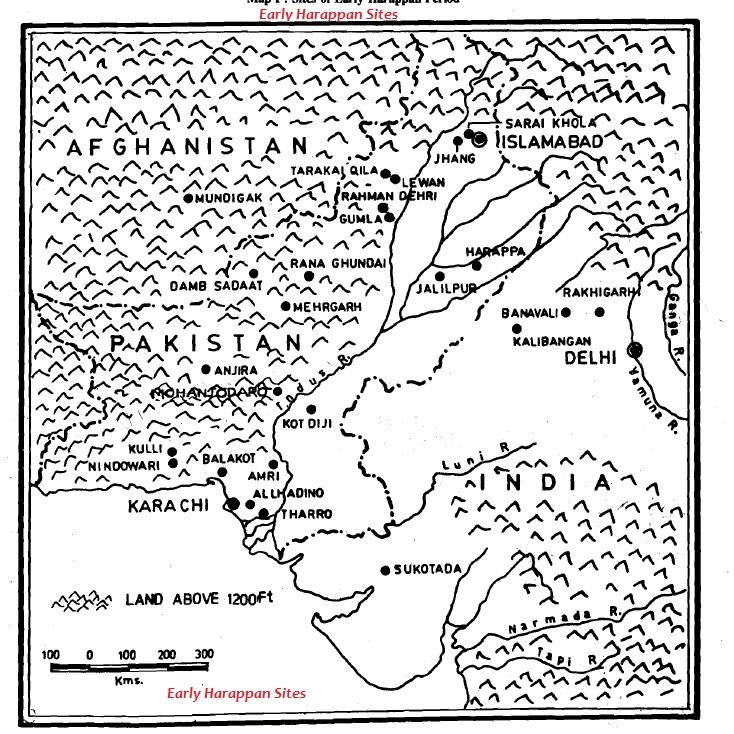 The better known settlements among them are Kili Ghul Muhammad in Baluchistan and Mundigak in Afghanistan. In the Indus flood plains villages like Jalilpur near Harappa had come into existence. All this led to the development of small towns. The period of this new development is called ‘the Early Harappan‘ because of certain uniformity found all over the Indus. P.S. – In the next series we will cover the findings and importance of particular Indus Valley Civilization Sites.